Hundreds of members of Islamist and left-wing political groups demonstrated outside the Tangiers Film Festival early last month against a documentary about Moroccan Jews living in Israel. They claimed that director Kamal Hachkar was promoting "normalization" with the Jewish state. But Hachkar was not expelled from the artists' union, nor was his film banned, and he wasn't ostracized from Morocco's intellectual class, as has happened in similar cases in Egypt and elsewhere. Instead, directors and actors circulated a petition of support, and his film went on to win best work by a new director at the festival. Once home to some 300,000 Jews, the largest population in the Arab world, Morocco is increasingly taking a fresh look at its long history with Judaism and is spurning the flat rejection of all things Hebrew found in so many other Arab countries. 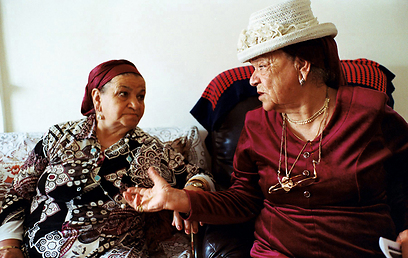 In the film, "Tinghir-Jerusalem: Echoes from the Mellah," Hachkar talks to people in Berber villages high in the Atlas mountains about their memories of the Jews suddenly leaving for Israel in the 1960s. He then travels to Jerusalem and finds many of these Jews, still speaking Moroccan Arabic and the Berber language, fondly reminiscing about the land they left behind. "It tells the story of a forgotten part of Morocco's history, a history that is not taught at school," Hachkar told The Associated Press. "My goal is to tell the human story and to defend the plurality of Moroccan history and identity." The director, who was born in Tinghir but left to live in France with his father at the age of 6 months, has toured all over Morocco showing the film to what he says were packed houses. Most people were initially suspicious, but warmed to the subject when they saw Jews speaking Moroccan Arabic and even the Berber dialect of the High Atlas, he said. According to Zhor Rehihil, the curator of the Museum for Moroccan Judaism in Casablanca – founded in 1997 and unique in the region – Jews have been part of Morocco since Jewish merchants came to North Africa with the Phoenicians hundreds of years before the birth of Christ. For centuries they were found in the mountain villages alongside Morocco's Berbers – the original inhabitants of North Africa – who mostly converted to Islam with the arrival of the Arab tribes in the 7th century. Morocco's Jewish population was invigorated in 1492 when Spain expelled Muslims and Jews, most of whom fled to Morocco and brought with them the sophisticated urban culture of Andalucia. "The Jews in Morocco were everywhere, in the cities, in the small villages. It was a country with a large and vibrant community of Jews and with their departure, Morocco lost a large part of its history," said Rehihil. With the establishment of Israel and the encouragement of Zionists, Morocco's Jews left. Some went for religious reasons to seek the long promised land, some for a better life than in economically troubled post-colonial Morocco, still others who feared persecution. Unlike elsewhere in the Arab world, the creation of Israel did not spark widespread animosity or attacks on Jews. There were isolated incidents but no national campaign. Many Jews left, however, after being told by Zionist agents they were in danger, said Rehihil. "Each time there was an Arab-Israeli war, there would be tensions and the Jews would become afraid and some more would leave," she said, adding that most had left by the 1973 war. Some 5,000 now remain, almost all in Morocco's commercial capital of Casablanca. As in the rest of the region, however, there has been a heavy focus in Morocco on the plight of the Palestinian people and many Moroccans have started equating Jews with Israel. In May 2003, a series of al-Qaeda-inspired bombings in Casablanca attacked, among other targets, a Jewish cemetery and a community center, which was empty at the time. Protests against Israeli military actions are a regular occurrence, the most recent in November over the latest clashes in Gaza. Tens of thousands marched through Casablanca and Rabat in demonstrations attended by members of the governing moderate Islamist party. "It's not a matter of denying the history of Moroccan Jews nor attacking freedom of expression, but defending one of the principal foundations of the nation, which is to say, no to normalization with the Zionist entity," said Mohammed Khiyi, a member of parliament with the Islamist Party for Justice and Development who demonstrated against Hachkar's film on February 5. He contended that the film "is trying to do Zionist propaganda. The real Moroccan Jews were those which stayed in their country and were proud, not those the film tries to portray as victims of deportation to Palestine." A surprising critic of the film is one of Morocco's Jews, Sion Assidon, a leftist activist, former political prisoner and a member of a group advocating the boycott of Israeli products. "The film is effectively a vehicle for the message of normalizing with Israel," Assidon told the AP. "The people we see are never once questioned about the essential issue, which is that they are colonizers occupying the land of another people that were earlier expelled." Ben Chetrit said that on a visit last year, "we were told (by legislators) `we are happy you are here, this is your home, but make sure you bring your children too.'" Israel has had a friendlier relationship with Morocco than with other Arab countries, and over the decades, the two have had trade, diplomatic and intelligence links, which have dwindled since the outbreak of the Palestinian uprising in 2000. Tourism, however, has remained constant over the years. Morocco's monarchy, the real power in the country, has had a complex position of balancing advocacy for Palestinians with a historic role of defending the Jewish community. On one hand it has presented itself as a protector of Muslim Jerusalem, founding the Jerusalem Committee of the Organization of Islamic Conference to fund projects to help the Palestinians living there. In a speech at an OIC meeting on February 6, King Mohammed VI condemned "the Israeli government's aggressive, unilateral practices against the Palestinians," namely the expansion of settlements. Morocco played a behind the scenes role in the 1990s getting Israelis and Palestinians to talk to each other and hosted Israel's then-Prime Minister Shimon Peres, in 1986. Tzipi Livni, then Israeli opposition leader, attended a conference in 2009. The monarchy has recently spoken more about preserving the Jewish heritage, and Judaism is enshrined as a component of the national identity in the 2011 constitution. In a ceremony this month that included German parliament speaker Norbert Lammert, the king sent Prime Minister Abdelilah Benkirane, of the same Islamist party whose members protested Hachkar's movie, to inaugurate the renovation of the 17th century Slat Alfassiyine synagogue in Fez. "We are calling for the restoration of all Jewish temples in the different cities of the kingdom so that they are not only places of worship but also spaces for cultural dialogue to renew the founding values of Moroccan civilization," declared the king's speech, which was read by the prime minister. Rehihil said young Moroccans visiting the museum of Moroccan Judaism on school trips were often hesitant, until they saw how the clothes, caftans and other Jewish artifacts were familiar to them as just Moroccan. Then the stories come out, she said, as people recalled their grandparents' experiences with Jews. "I am part of this new generation that did not live with the Jews," said Rehihil, referring to those born after 1960. "The Muslims were traumatized by the departure of the Jews as well. You will not meet a Moroccan who didn't have someone in the family with a Jewish friend, a Jewish neighbor, or worked with a Jew, or whose grandmother learned embroidery with a Jew or whose grandfather did business with a Jew." See all talkbacks "Morocco film searches out Jews who left "